After watching lectures DMM268 and DMM300 at SAP Teched 2016, I was really excited about the possibilities of SAP BW and SAP HANA mixed architectures options. Before we begin with the examples, let’s have a quick overview of this concept. What is a Data Warehouse Mixed Architecture? It’s an SAP best practice for modern data warehousing. 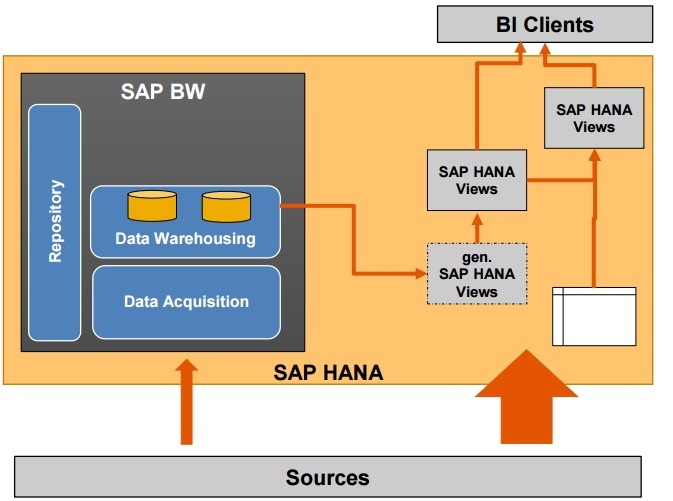 Simply put, it’s a data model that is implemented at the same time in SAP BW and native SAP HANA. What are the benefits of this Mixed Architecture? It combines processes, data and metadata of BW and native HANA, bringing the best capabilities of both worlds in order to gain flexibility and insight. 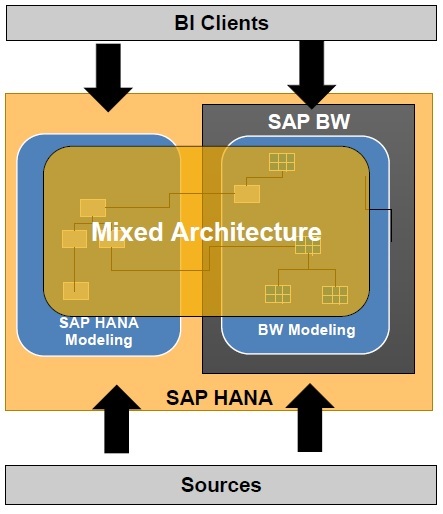 SAP HANA and SAP BW deliver integrated tools to manage mixed scenarios end-to-end, including modeling, transport mechanisms and consumptions interfaces. SAP HANA database is the central runtime for reporting and data warehouse process, offering best in class performance and scalability. 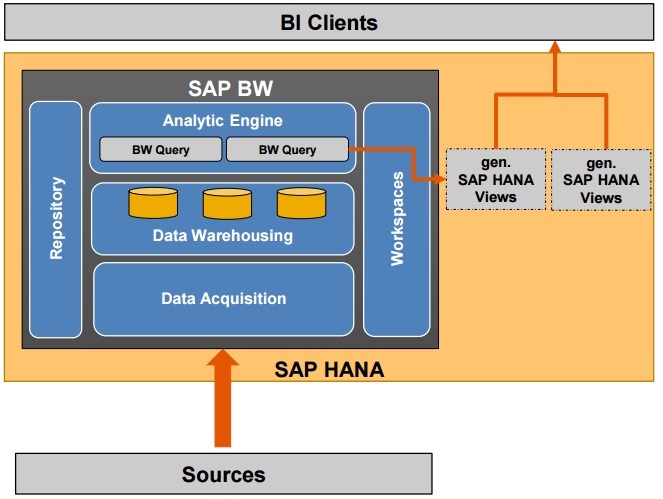 HANA analytic privileges based on BW analysis authorization. These generated SAP HANA views can be enriched in HANA Studio. 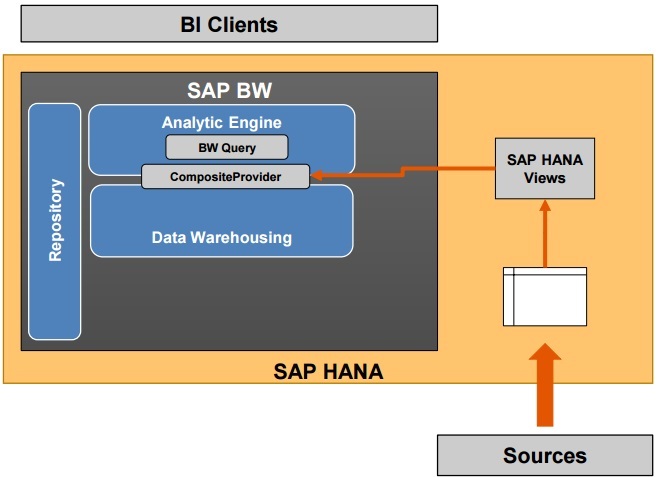 SAP HANA views integrated into SAP BW using a Composite Provider. 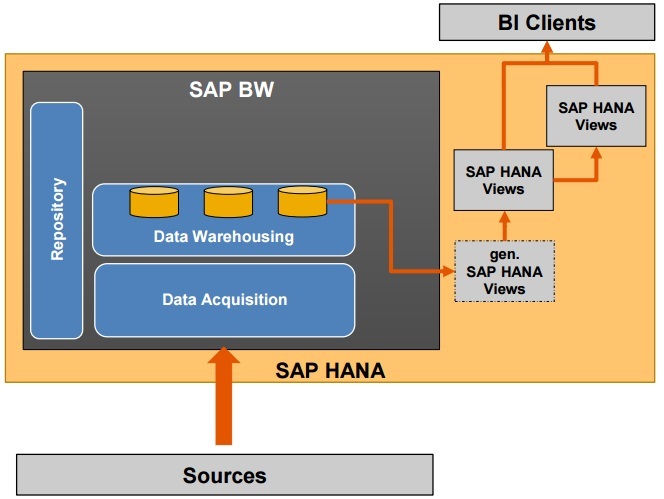 BI clients can consume data via native HANA. E.g. SAP HANA Live views integrated into BW. These are just few examples of what can be achieved used SAP HANA and SAP BW mixed architecture. Is your company using any of the above approaches? Or have you ventured in another mixed architecture solution? Feel free to share with us. Great blog and great approach: use cases. It helps put the conversation into specific topics. I would like to add an architecture and data management approach. When thinking the DW as a part of a mayor Data Management landscape, with multiple components and applictions, having new functionalities (mostly industry standards) that easy the integration you got a better solution. Hybrid scenarios tells: “you can work with BW and/or HANA, but also you can integrate with BW and/or HANA”. Thank you Tiago. 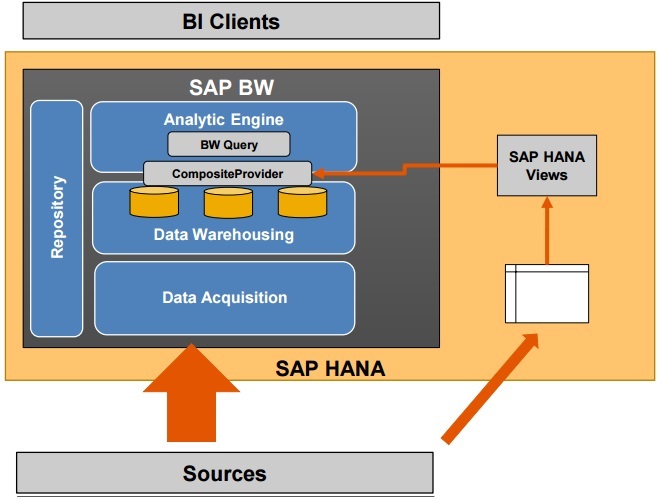 There are a number of use cases of BW and HANA integration, due to transparency in BW to generate/ consume HANA views. Here comes another possibility which works for 3) and 5). As the Composite Provider that is based on a HANA Calculation View has a bad Performance, because the view holds a lot of calculations, etc., it is possible to load the data of the HANA View into an ADSO. By this the data is persistent in this ADSO (in BW). On top of this ADSO you can build your Composite Provider + BW Query. Thereby the Query is reading from the persistent data in the ADSO and not from the slow HANA View. You named already the reason for a bad performance but generally I wouldn’t say that they have a bad performance. On the other side I can recommend modeling Composite Provider on HANA Calculation Views when you pay attention on workload and architecture. Just to add to my knowledge can you please highlight steps in short on how to load the data of the HANA View into an ADSO. Create an ADSO. Choose your DataSource as Template. You should mention also SID generation in aDSO, as currently it can be option for each IO not whole aDSO. 🙂 , next reporting performance consideration vs ETL performance :). I am trying to implement this Scenario. I am creating Data Sources on Native HANA CV’s connected through DB Connect. But I am afraid how I can achieve Delta functionality in this scenario. I believe I don’t have any Delta feasibility in this approach. Every time I have to load full data in to BW aDSO’s, but every-time full loading of Huge tables would take lot of time to load. Could you please suggest me on how to achieve Delta Functionality. Materializing of HANA CV depends from complexity of calculation. Indeed materialized logic will be faster than Virtualized. Art of choosing 🙂 is new black vs old days with limited BW options (cubes, multiproviders….). Thank you for sharing the information. We have to have open eyes with these mixed architectures because according to roadmap of SAP Data Warehouse technology, this integration will continue. As far as I know reporting directly on HANA with BW on HANA (depending on the HANA license, mostly runtime or edge license) is not allowed by SAP. The BW queries are also integrated to workbook solutions and published as a transactions in Business Client. Hi, We have done one scenario. we have done Szenario 5 at a customer implementation. Although we have problems with the Performance. Mainly because of SID evaluation in the composite. We still searching for a method to increase the performance. any suggestions? What about engines used in scenario where you have aDSO and Calculation View in composite provider? Technically there is a few scenarios but what about pros and cons. Funeral of BW was announced by some salesman at beginning of Hana. Now it is more visible that small details like SID make huge difference in performance. Is there any roadmap of Hana modeling tools (engines)?